For the sixteenth round of Art on the Marquee, Boston Cyberarts and the Massachusetts Convention Center Authority (MCCA) will be presenting ten new works created by talented Massachusetts residents on the 80-foot-tall multi-screen LED marquee outside the Boston Convention & Exhibition Center in South Boston. 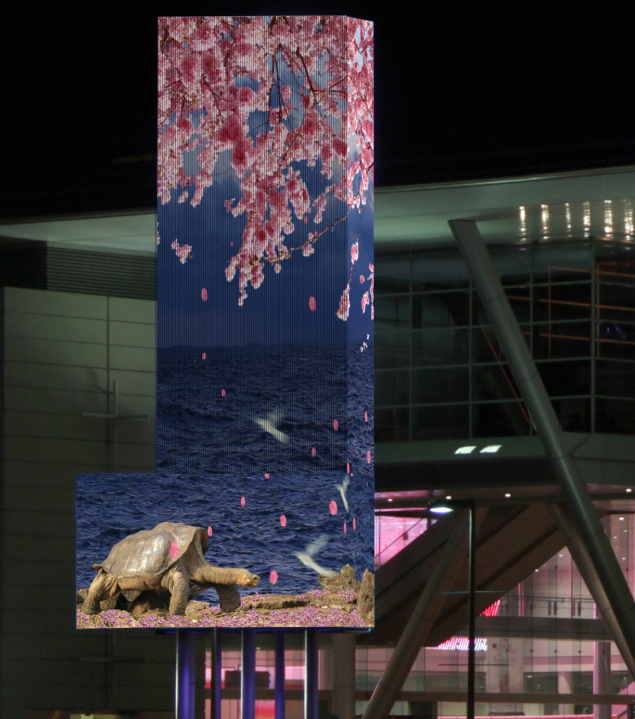 All of the artists have created unique digital pieces specifically for the Marquee. An opening will be held on Wednesday, December 16th at the BCEC, 415 Summer St., Boston, MA, from 6:00 p.m. to 8:00 p.m. 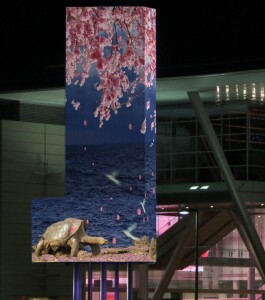 This unique, digital sculpture hosts an alternating array of media-based exhibitions. Similar to a physical exhibition space, each round is distinctive, premiering contemporary concepts and visuals. Exploring anxiety and tension, Evelyn Eastmond shows the release of tension as a disembodied and externalized object. In his piece, Boston Harbor Robots, Fish McGill examines a group of abandoned robots who are stuck at the bottom on the Boston Harbor. Probing ideas surrounding the ephemeral nature of existence, Allison Maria Rodriguez considers the life of Lonesome George, the last of the Pinta Island tortoise subspecies, who passed away in captivity at a research station in the Galapagos. With his passing, there is the finality of extinction. Sarah Bliss, Sean Bowes, Jan Roberts-Breslin, Corey Corcoran, Evelyn Eastmond, Gina Kamentsky, Roscoe Lamontagne, Fish McGill, Allison Maria Rodriguez, and Rebecca Wasilewski.